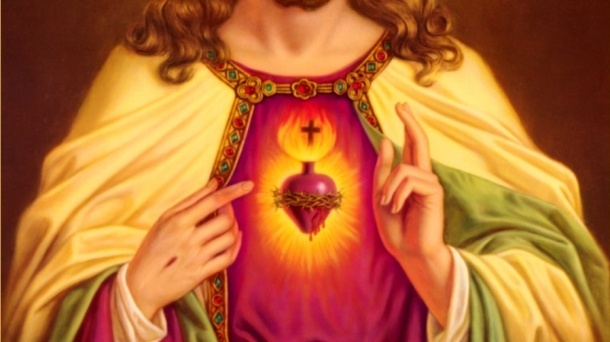 The Solemnity of the Sacred Heart of Jesus presents us with the opportunity to reflect on the relevance of this venerable symbol in our daily lives. The image of the Sacred Heart is never mentioned as such in Sacred Scripture, but its meaning can be found spanning each page from Genesis to Revelation. Today’s readings point to this fact and frame the Sacred Heart in terms of two central themes: love and closeness. They speak of the love of God as a shepherdly love, an involved love, a powerful love; a love that is up-close and personal, that seeks out the lost, heals the afflicted, strengthens the contrite, upholds the humble, and calls men and women of every time and place to be all they can be, to love in return, to have life in abundance: to be holy. We see here that the image of the Sacred Heart is intimately linked with the image of the Good Shepherd. The first reading, where the God of Israel Testament speaks to Ezekiel of how He Himself will tend the sheep of His flock; how He will “gather them from foreign lands” and “lead them out from among the peoples,” pasturing them on verdant mountains, that they may lie down and be at rest. These words are echoed in today’s psalm, the renowned and beloved Psalm 23, which conveys the profound peace of a sheep of God’s flock. The Gospel for today’s solemnity extends this theme and gives it its full depth. It is the story of the lost sheep; but above all, it is the story of the Shepherd, who leaves the ninety nine in search of the one. This is precisely what the Church celebrates today, a love so profound, so immediate but immense that it defies human reason. It goes beyond any logical constructs and extends beyond our faculty to comprehend. The Sacred Heart is the symbol of God’s incarnate love, a shepherdly love, a dynamic love: a love brought to life by the Incarnation of Jesus. In Christ we realize that our God cares for His sheep not in a general or indifferent way, like a rich uncle who sends cheques but never calls or comes to visit. His love isn’t just an overall affection for humanity. Rather it is an intense solicitude for each and every sheep, each and every one of us that desires relationship and intimacy. God so desires this intimate relationship that He willed to humble Himself and enter the human drama. He chose not just to admire the sheep from afar, but to dwell in there midst, to smell as they smell and devote His entire life and livelihood to their care. In this way the Incarnation is the ultimate seal of God’s desire to be close; the ultimate sign that God’s love reaches out to us, invites us, draws us—personally. There is no red tape between us and the love of God. For by the coming of Christ and the wounds of His death all boundaries and all barriers have been torn asunder. Thus it is appropriate that Incarnation and Passion both feature in the depiction of the Sacred Heart. The heart depicted is a human heart, a fleshly heart, a living heart; but it is also a pierced heart, a bleeding heart, encircled with a crown of thorns and punctured by the blade of a spear. Jesus’ heart reaches out for us, it goes out in search of us; it pines after us as a shepherd for a lost sheep. Let us take a moment today to imagine ourselves as that lost sheep of Luke’s Gospel. As a sheep loved by the Shepherd, whose loving heart follows after it wherever it may go always seeking the good of His fold, gathering them together in love, and leading them in peace by His gentle voice. Each of us is the lost sheep: as individuals, as communities, and as a human family. God seeks to reconcile us to Himself and loves us so much that He sends Jesus, the Good Shepherd, in search of us, to bear us on His shoulders and bring us back rejoicing to the eternal pastures of the New Jerusalem. And so today let us take to heart the rich meaning of this ancient devotion; let us allow ourselves to be struck by the love of Christ. In the ordinary moments of our lives, the simple as much as the spectacular, the majestic as well as the mundane, may we be transformed by the knowledge that we are loved and respond with gratitude to love in return. May our hearts beat along with the heart of Jesus, be conformed unto His, and in doing so become channels of His intense, intimate love for each person; that our hearts too may be afire with the incarnate love of God.